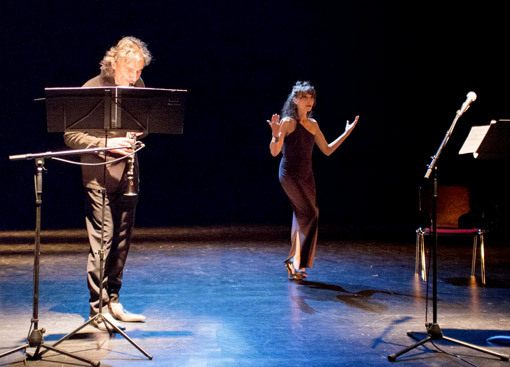 Accroche Note are an ensemble of soloists formed around the soprano Françoise Kubler and clarinettist Armand Angster. Their aim is to lead in the promotion of today’s music through a variety of mediums and genres. The programme of each concert dictates the number of musicians who constitute the ensemble. The flexibility of the group, from solo musician to large chamber ensemble, allows them to tackle varying projects; from the historical pages of the classical repertoire to instrumental and vocal literature of the 20th and 21st century. Other projects centre around improvisation through jazz and other improvised traditions. For several years now, the ensemble have developed a policy of commissioning music and working in direct collaboration with composers. Recent premieres given by Accroche Note include works by Pascal Dusapin, Pierre Joldowski, Luis Naon, Alberto Posadas, Philippe Manoury, Marco-Antonio Perez-Ramirez, Ivan Fedele, Zad Moultaka et Bruno Mantovani. The ensemble is regularly invited to numerous national concert seasons, as well as international festivals of contemporary music. Their reputation has taken them from their hometown of Strasbourg where they are regularly invited to the festival Musica, to Stockholm (New Music Festival), Parme (Traiettorie), Tokyo, Ljubljana (Slowind Festival), New York (Terni Cultural Institute), Huddersfield (Huddersfield Contemporary Music Festival), Baku (Kara Karaev Festival) and many other cities and venues of note. Accroche Note have dedicated several CDs to monographic projects, including Dillon, Dusapin, Manoury, Mâche, Feldman, Aperghis, Fedele and more recently Greif, Jolas and Essyad. Récital I, released in January 2008, is the first in a new collection of albums in the Récital series, which relives great moments recorded by the soloists of Accroche Note. Major chamber music works written for the group in the past years feature alongside new works which have enriched this creative contemporary repertoire. The group has released a double CD in 2013 about 30 years of creating new music at the festival Musica and in 2016 Solo clarinet by Armand Angster with Bertrand’s, Ferneyhough’s, Posadas’, Fedele’s, Lachenmann’s and Robin’s works. In september 2018, Accroche Note create a new opus En Echo by Françoise Kubler (soprano) and Armand Angster (clarinet), with wotks of Donatoni, Naon, Mantovani and Manoury.